Pictured is C/Amn Nicholas Hamlin left, and C/A1C LeBron Gloor, right. 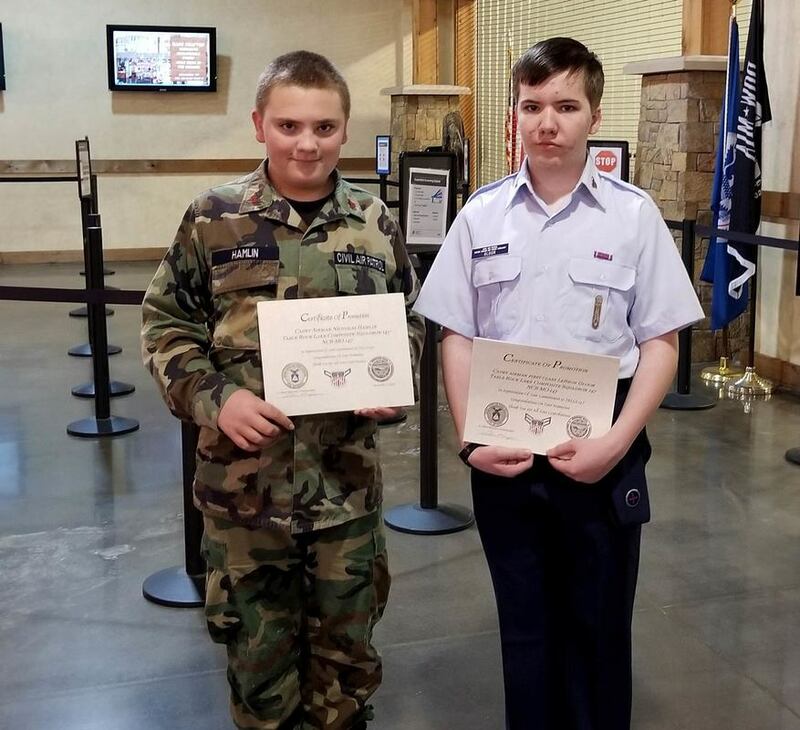 Table Rock Lake Composite Squadron, the local squadron of Civil Air Patrol is pleased to announce that Cadet LeBron Gloor was promoted to Airman First Class and Cadet Nicholas Hamlin was promoted to Cadet Airman on the evening of Thursday, November 1, 2018 at the regularly scheduled weekly meeting held at Branson Airport. Cadet A/1C indicates completion of the second of 16 series of cadet ranks awarded to cadets in CAP. Cadets must pass an aerospace program along with a leadership, drill and physical fitness test. Cadets also must attend at least one Moral Leadership session. Along with this, Cadets sometimes begin serving as element leaders or begin working towards the experience of being flight sergeants while polishing their skills in learning how to be effective followers. The General H. “Hap” Arnold Achievement Award is presented to a cadet that is promoted to C/A1C. Cadet Airman is a grade that indicates the completion of the first achievement of 16 in the Civil Air Patrol cadet program. Requirements to obtain this grade are a test on the fundamentals of leadership, a drill performance test, and a physical fitness test. Also included in promotion is attending at least one Moral Leadership session provided by the squadron, as well as completing the new Wingman Program and passing a quiz. The General J.F. Curry Achievement Award is presented to a cadet that is promoted to C/Amn. At the recent Missouri Wing Conference held in Branson, Table Rock Lake Composite Squadron 147 was awarded the Aerospace Education Excellence Program 2017-2018. Major Lanna Fletcher displays the certificate for that honor. Major Fletcher was recently awarded the Aerospace Education Officer of the Year for Missouri Wing, Group V.
Congratulations to C/A1C LeBron Gloor and C/Amn Nicholas Hamlin. Congratulations also to Table Rock Lake Composite Squadron for receiving the Aerospace Education Excellence Program award. Squadron 147 meets on Thursday evenings from 6:30 – 8:39 pm at Branson Regional Airport in Hollister. On the fourth Thursday evening, the squadron meets at Hollister Middle School. If there is a fifth Thursday in the month, there is no meeting for Senior Members. Adults of all ages and youth from 12-18 years of age are encouraged to become a part of Civil Air Patrol. Come visit with us and see how you can be of service to your community, state and nation. Please call Lieutenant Steve Meinzen, Squadron Commander at (913) 709-7919 if you have any questions. We look forward to seeing you some Thursday evening.